Be the first to share your favorite memory, photo or story of Leola. This memorial page is dedicated for family, friends and future generations to celebrate the life of their loved one. 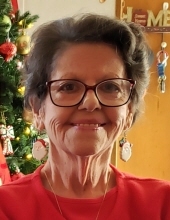 Mrs. Leola Sutton Cox, 70, passed away peacefully at home with her family by her side Saturday, February 9, 2019. The funeral service will be held Wednesday at 2 PM at the Greenville Church of God. Burial will follow in Pinewood Memorial Park. Mrs. Cox, a native of Carteret County, was the daughter of Leo and Eloise Willis Sutton. She lived her early life in Salter Path and moved to Greenville when she was 15. She worked at Too Tuff Toggs in Grimesland for a number of years. Mrs. Cox was a member of the Greenville Church of God, where she sang in the choir for many years. She was a devout Christian who spent her life serving others. She loved spending time with her family, especially her grandchildren. In addition to her parents, Mrs. Cox was preceded in death by a sister, Myrna Byrd. She is survived by her husband of 52 years, Robert Lee Cox, Sr.; sons, Robert Lee Cox, Jr. (Robbie) and wife, Teresa, and Jay Lee Cox, Sr. and wife, Tina, all of Greenville; sisters, Faye Millaway of Winterville, Loretta Cherry and husband, Jack, of Winterville, Pam Garris and husband, Randy, of Ayden, and Susanne Baker (Sue) of Greenville; brothers, Danny Sutton of Farmville, Johnny Sutton and wife, Beth, of Greenville, and Jimmy Sutton and wife, Tina, of Farmville; grandchildren, Joshua Cox, Jay Lee Cox, Jr. (JJ), Sheryl Wynne, Christina Cox, Robert “Dale” Cox, and Zachary Cox; great-grandchildren, Noah Wynne and Jay Lee Cox, III (LJ); and many nieces and nephews. The family will receive friends Tuesday from 6 to 8 PM at the Greenville Church of God. To send flowers or a remembrance gift to the family of Leola Sutton Cox, please visit our Tribute Store. "Email Address" would like to share the life celebration of Leola Sutton Cox. Click on the "link" to go to share a favorite memory or leave a condolence message for the family.